LA QUINTA, CA: The Annual Taste of La Quinta will again return to Old Town on January 14th, 2017. The unique event blends culinary and wine tasting into a can’t miss celebration for foodies and wine connoisseurs alike. The event is held on Main Street in popular Old Town La Quinta. Old Town’s enchanted Main Street is in one of the most idyllic locations in the valley. Surrounded by sunny mountain vistas, this picturesque village beckons residents and tourists alike as it embraces the creativity of culture, style and cuisine. Surrounded by artisans and boutique shops, the ambiance of Taste of La Quinta creates a world-class entertainment experience. Confirmed restaurants for this year’s event include local favorite Stuft Pizza, Minus30, the La Quinta Brewing Co., and the culinary team from Fantasy Springs Resort & Casino, home of JOY Asian Cuisine and The Bistro. Attendees will be able to sample generous portions from each of the participating restaurants. 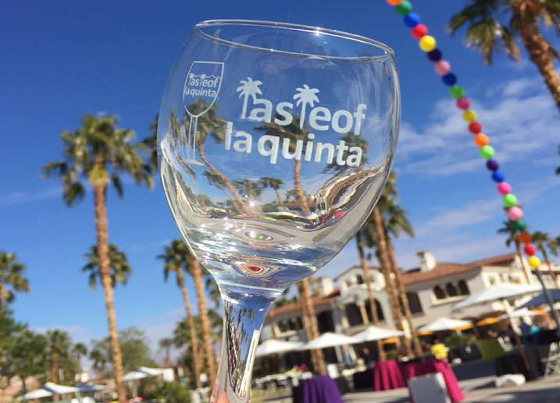 For wine lovers, the Taste of La Quinta hosts a special wine tasting experience as well. Ticket holders will be treated to unlimited wine tasting from a variety of local wineries (while supplies last). Wilson Creek Winery is one of the featured Southern California vineyards that will be on hand offering samples. The Taste of La Quinta will be held January 14th, starting at 1:00 PM. Old Town La Quinta is located at 78100 Main St, in La Quinta. Ticket prices go up $5 on event day, at the entrance. Buy your tickets at Eventbrite. See you there! For more details or to purchase tickets in advance, visit evenbrite.com or call the Greater Coachella Valley Chamber of Commerce at 760-347-0676. To receive regular updates, follow the Greater Coachella Valley Chamber of Commerce on Facebook, or visit gcvcc.org.